Your marketing campaigns in Turkey can make a leap forward with Blue Mail Media’s highly reliable Database of Turkey Business Executives. Our database has been designed to help you connect with key decision makers, C-Level Executives, and professionals from numerous industries without passing through too many gateways in communication. Our Turkey Business Executives List fulfils all the multi-channel marketing data needs of marketers with respect to their email/ mail or telephone campaigns. With Blue Mail Media’s strong data repository, you are sure to gain significant response on your targeted marketing campaigns and increase your chances of converting leads into business. We house a team of data scientists, experts and professionals who put great amount of efforts in making sure our data meets the highest standards in terms of quality, and bring you greater returns on your investments. 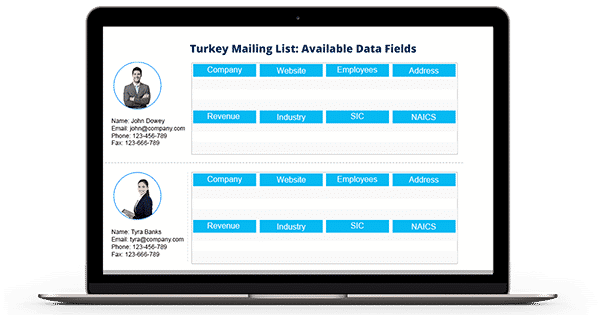 To help marketers execute their plans better, we provide pre-packaged as well as customized Turkey Business Executives Mailing List that aligns perfectly with their marketing objectives. Moreover, no matter where you operate in, Blue Mail Media can help you proactively with a strong data partners network spread across USA, UK, Canada, Europe, North America, APAC and other regions. We carefully collect data from reliable sources, verify data for accuracy and update the same on a timely basis to ensure our database remains up-to-date at all times.